371 people want to go here. 69 people have been here. Iceland is a Nordic European island country in the North Atlantic Ocean, on the Mid-Atlantic Ridge. The country has a population of about 320,000 and a total area of 103,000 km (40,000 sq mi). 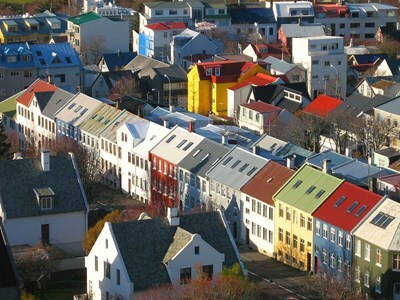 The capital and largest city is Reykjavík, with the surrounding areas in the southwestern region of the country being home to two-thirds of the country's population. Iceland is volcanically and geologically active. Iceland has a high concentration of active volcanoes due to unique geological conditions. The island has about 130 volcanic mountains, of which 18 have erupted since the settlement of Iceland in 874 AD. Of these 130 volcanoes, the most active/volatile is Grímsvötn. Over the past 500 years, Iceland's volcanoes have erupted a third of the total global lava output. Gullfoss is a waterfall located in the canyon of Hvítá river in southwest Iceland. 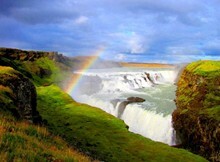 Gullfoss is one of the most popular tourist attractions in the country. The wide Hvítá rushes southward. About a kilometer above the falls it turns sharply to the left and flows down into a wide curved three-step "staircase" and then abruptly plunges in two stages (11 m and 21 m) into a crevice 32 m (105 ft) deep. Thrihnukagigur volcano is dormant – it last erupted over 4,000 years ago. There are no indications of it erupting again in the near future. The volcano’s name, mostly unpronounceable for anyone other than locals, would be directly translated as ‘Three Peaks Crater’. The name comes from Árni B. Stefánsson, who was the first to explore the vault and who has pleaded the case for making it accessible for years. One of the most popular tourist attractions in Iceland, the Gullfoss is a 2-tiered waterfall with a total height of 32m (105ft). Also known as the Golden Falls, the Gullfoss is part of the Hvítá river. Nearby attractions include the Haukadalur geysers and Þingvellir national park. Together, these 3 sites are called the Golden Circle. Because of the popularity of the falls there is hotel accommodation nearby, but most visitors opt to stay in Reykjavík and visit the falls on the Golden Circle day trip." The most famous waterfall of Iceland situated between the Selfoss waterfall and the Skogafoss waterfall in the river Seljalandsfoss. This waterfall is 60meters tall, it looks beautiful as it falls down from the cliffs and its suppose to be one of the most picturesque waterfalls of Europe. The best part of this waterfall is that you can walk behind the waterfall and see the water falling down like a mirror which makes it one of the most beautiful places to visit."